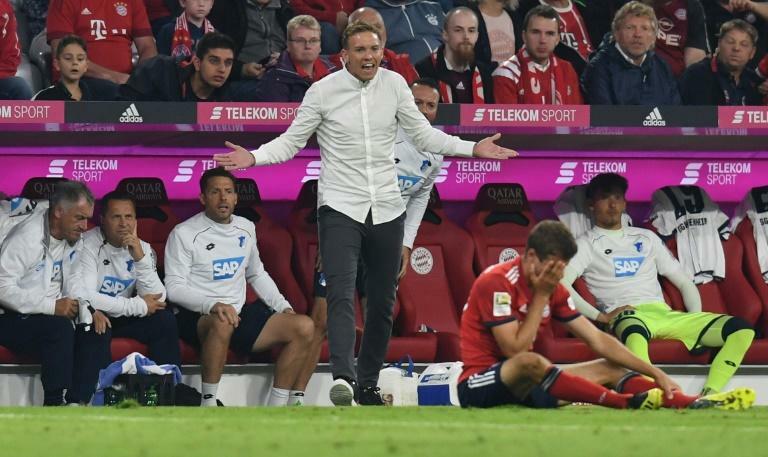 The video assistant referee (VAR) has made a controversial start to the new Bundesliga season in Germany which left Hoffenheim coach Julian Nagelsmann fuming. The VAR worked well at the World Cup in Russia, but added to its blighted reputation in Germany during Bayern Munich's 3-1 win over Hoffenheim on Friday. With the scores at 1-1 late in the opening league game of the season, Nagelsmann was incensed when Bayern were awarded a penalty after Franck Ribery went down in the area following a Havard Nordtveit tackle. Replays showed Bayern's French winger jumped over Nordtveit and no contact was made, but the VAR failed to intervene after referee Bastian Dankert awarded the penalty. "Why the buildup to the penalty was not checked is a mystery to me," scolded Nagelsmann, 31, who will leave Hoffenheim at the end of the season to coach RB Leipzig. "Football is a contact sport and if the player is blocked, but there is no contact, then it is not a foul -- it's marginal. "Where were the video assistants?" Robert Lewandowski took the resulting penalty, but when his shot was saved, Arjen Robben tapped home the rebound. However, the penalty had to be retaken as the VAR spotted that the Dutchman entered the area too early and Lewandowski finally converted the spot kick on 82 minutes. Robben then added a third goal in added time as defending champions Bayern made a winning start in their bid to claim a seventh straight league title. "There was a stupid period of video watching," fumed Nagelsmann, who will make his Champions League debut with Hoffenheim this season. He said: "You don't need to have 14 screens in Cologne," where the VAR is based for Bundesliga matches. "Put on extra screens in the stadium. It would cost less and we don't always have this switching back and forth." Both Bayern's new coach Niko Kovac and director of sport Hasan Salihamidzic agreed with Nagelsmann over the penalty. "I don't think it was crystal clear - I would not have given it," admitted Kovac, while Salihamidzic agreed "it was a bit strange". Thomas Mueller, who scored Bayern's opening first-half goal, joked that the VAR gives fans value for money. "It's an automatic extra time, because the spectators at least get more for their cash." However, Mueller's jokes aside, Friday's VAR controversy does little to help the much-maligned system in Germany, where it has started its second season. The VAR endured a turbulent debut in the 2017/18 season as German players, fans and pundits complained about long delays in making decisions, which were often then bemusing. Embarrassingly, Hellmut Krug, the Bundesliga's former VAR chief, was replaced last November amid allegations he influenced decisions to help Schalke -- the team he supports.